Carrying your smartphone while running provides several options to improve your running. Whether it’s music, fitness+tracking apps, or a training program for a long-distance race. No matter the application, I think we can all agree that bringing along your smartphone is helpful, and in a big way. But where do you put your phone during a run? Do you carry in your hand? Tuck away in your pocket? Stick it in a running backpack? 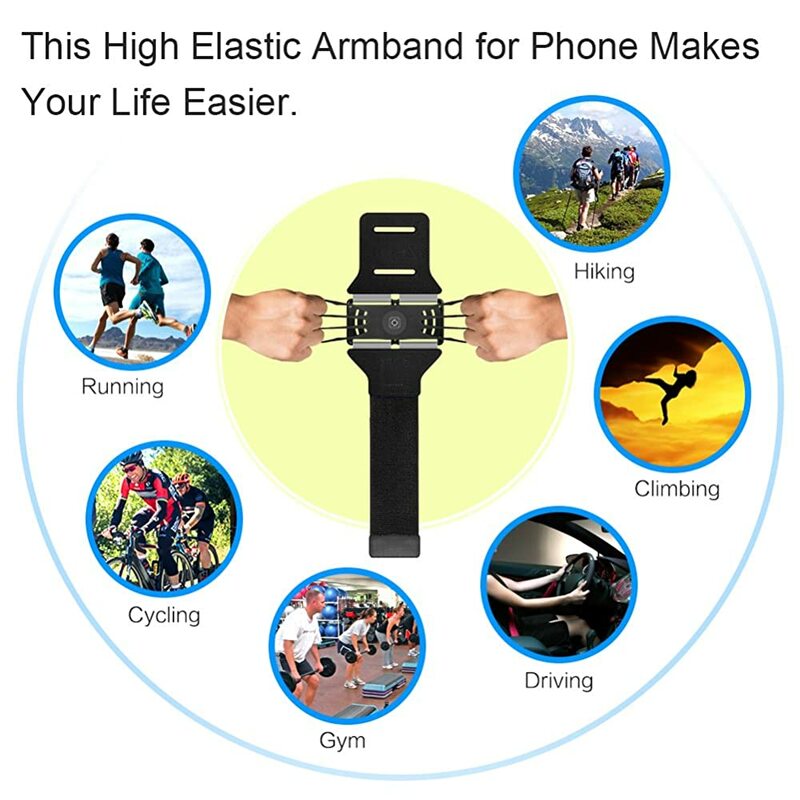 Well, one of the most popular solutions to this dilemma is using a running armband. That’s right, they make bands that attach directly to your upper arm. Now, carrying your phone switches from frustration to convenience. Ready to try a running armband? If so, read on to learn how to choose the best running armband for you. Convenient place to put your phone while running. Utilizes pockets for holding small items like cards, keys, and money. Can use fitness or running tracking apps like Strava. Don’t need a music player anymore. Carrying your phone is an all-in-one solution. Can use music, GPS, and tracking apps simultaneously on most smartphones. Keeps phone safe from falling and/or rain. Commonly available at a low cost. Post on social media while running or take pictures for later. As you can see, there are many benefits when using a running armband. So ask yourself, how will an armband help your running? Next, let’s discuss how to choose the best armband for you. If you’ve decided that running with an armband is right for you, the question now becomes, where do you start? Fortunately, choosing the right band isn’t all that difficult. Most have the same basic design with just a few different features that distinguish one from the other. So read on to gain knowledge of the few essentials you should know when browsing between the different types. More most, fit will be most crucial when choosing a running armband. There are one-size-fits-all options as well as sized types. They both can come in either come as a compression sleeve or with a hook-and-loop strap. If there are different sizes, make sure to measure your upper arm circumference. Take a tape measure and wrap it around the area of your tricep. Next, take your measurement and compare it to the armband’s sizing chart. Ninety-nine times out of one hundred there will be a size available that fits. Some bands even come with an extension for those of us with larger arms. So, now that you know how to choose the right fit, next, let’s discuss storage. First and foremost, you want to make sure your phone will fit in the compartment. Smartphones have been coming out in many different sizes both small and large. I remember the time a bought an iPhone 8 screen protector for my iPhone 7–BIG difference. 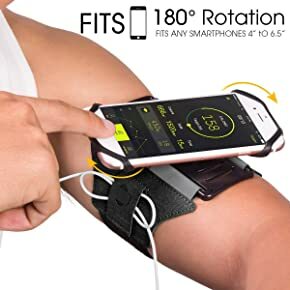 In the same sense, you don’t want to buy a running armband that only holds a standard iPhone when you have the iPhone plus. The point: again…make sure your phone will fit. Most running armbands will have a list of compatible phones. The only exception is if the armband is a one-size-fits-all style. Next, inspect the running armbands storage capacity. If you want to bring along small items like keys and cards, make sure there’s storage to do so. If it has extra storage, you may even be able to get away with holding gels, salt tabs, or endurance powder. Fortunately, smartphones have reduced in size over the years. So, chances are, you won’t have an issue fitting your phone. However, if you have an extra-large case like the Otterbox, make sure there’s extra room. Now that we have covered storage, let’s jump into functionality and list a few different features to look for. As you can see, many features contribute to running armband functionality. So do some research and decide what’s most important to you. Next, let’s talk about the security of your smartphone. The whole point of a running armband is to hold your phone…not drop it. So make sure you choose a band that securely holds and protects your phone. How does the phone stay attached? Does the phone pocket shut securely? Is it water-proof for rainy days? Will the armband bounce around on your arm? Some armbands come with foam lining inside the pocket for extra protection. Also, Velcro is a superior option for securing your phone while still remaining lightweight. Velcro style straps tend to prevent bouncing which otherwise leads to the armband sliding down off your upper arm or causing chafing. So, now that you have been debriefed on the security of an armband, let’s end with safety. When it comes to the safety of a running armband, I’m referring to making yourself visible, especially at night. To help increase safety, some armbands come with reflective strips. Yes, you should still where more safety gear when running at night. However, it’s an extra line of defense for remaining visible to passing vehicles on the road at night. Now that you know how to choose an armband, it’s time to choose one. 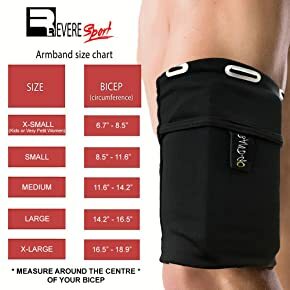 Fortunately, below are a list of the best running armbands in 2019. So, read each review, and select the best option for you and your running style. 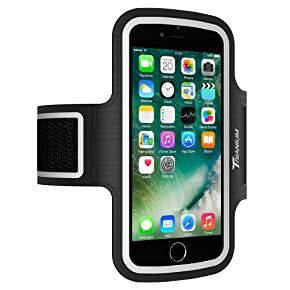 The Velcro strap makes using the Trianium running armband incredibly convenient. For any runner, stepping on and off the ground can cause the armband to bounce, ultimately sliding down your armband. No one wants to repeatedly adjust their armband while trying to focus on their run. It becomes bothersome over time. Well, that’s where the Velcro strap comes in. Not only is this armband’s strap sturdy, but it allows for quick and easy adjustments on the fly. In addition to its super convenient strap, this band comes with a touch-screen compatible protective screen. So not only can you change songs and make calls without removing your phone, but there are water-proof properties as well. It even comes with a built-in key pocket for and a hole for headphone wires. Can you say convenience? Low-cost but still has many features. Waterproof for rain and sweat. Velcro strap is convenient and fits larger arms. Velcro works poorly in the rain. The Tribe AB37 fits snug and best of all, it’s designed to prevent arm slippage. Sometimes running becomes intense, especially when trail running. Mix that with sweat on your arms and the weight of your phone, and some armbands will slip down your arm. Well, this isn’t the “some.” In fact, it’s built with a non-slip design that utilizes an adjustable elastic band. Now you can run faster with more confidence and not become distracted by a bouncing armband. In regard to sizing, it fits arm sizes ranging from 9 to 16 inches. A bonus feature is its thick reflective borders which provides extra safety at night while running on the road. Super comfortable with a flexible elastic band. No slipping even when running on rugged terrain. Not all phones matchup with headphone holes. What you’ll notice first about the E Tronic running armband is its slim construct. This design may appeal to a more minimalist runner like myself. For me, less is more, and the armbands lightweight nature can be quite refreshing. Plus, it’s made with a soft compression sleeve which assures its one-size-fits-all claim. The compression material also eliminates the potential of any scratching or chaffing of the arm. In regard to the pocket size, it can hold just about any size phone (granite we are talking about today’s smartphones and not a cordless phone from the 90’s!). To be more precise, it recommends phone sizes from 2” to 7”. There’s an excellent storage capacity as well. Whether it’s a set of keys, or money, or even a wallet, this running armband has you covered when it comes to stashing supplies. I’d also go as far as throwing a few gels or endurance powder in the pocket for longer runs. Spacious storage for supplies or large smartphones. Reflective logo for extra safety. Soft material to prevent chafing. Pocket cover phones screen, no touch screen option. Before buying the Portholic armband, take out a tape measure and measure the circumference of your upper arm. Simply put, make sure it will fit. 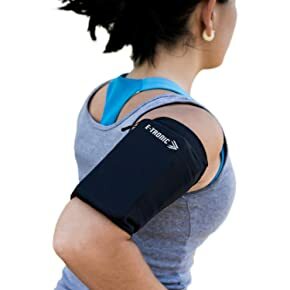 However, between the size of the original strap, and the included extension strap, this running armband will fit any arm between 9 to 18.5 inches. It even comes with a pocket for keys and cards. As you might expect, this becomes super convenient, trust me, I know. As a runner, I’ve jumped through my house windows far more times than I’d like to admit. And here’s a BIG plus: it’s compatible with a fingerprint touch screen. 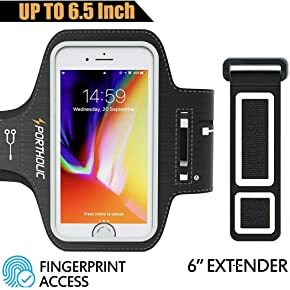 So, iPhone users, the Potholic running armband is a great option. When it comes to its construct, its lightweight and made from Lycra and Neoprene material. That makes it ideal for heavy sweaters too. Especially those who run in hotter climates. The company calls it’s sweat protection feature “triple sweat-resistance.” It’s an extra preventative measure taken to prevent sweat from entering into the phone compartment. Overall, this armband is a safe bet for all your running needs. The extension allows for arms up to 18.5”. Secure strap for preventing excess bouncing. A Bit bulky for some. 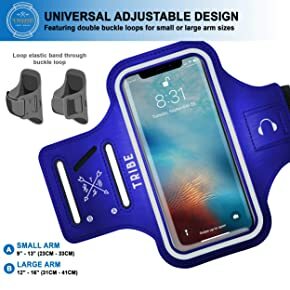 The Tune belt armband proves to be your best option for phone fitment. What do I mean exactly by phone fitment? Sure, most armbands fit most phones, but what about phones with an added cover? And what if you use a large protective cover like the Otterbox? Well, this armband is built for that specific situation. Protective cases are an extra line of defense to protect your phone when running and the Tune Belt fits larger phones without a problem. For example, if you have an IPHONE X with a LifeProof case, there’s no need to worry, it will still fit, and it will fit snug. A few extra perks are its comfortable material, sweat-resistant fabric, wrap cord for headphones, and touchscreen functionality. 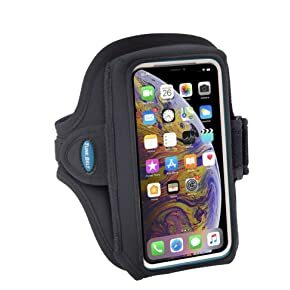 Overall, it’s an excellent running armband for any runner, especially those with protective phone cases. Velcro strap makes it easy to adjust on the fly. Touch screen convenient for changing songs while running. Large pocket for holding larger phones. If you are looking for a simple design that won’t break the bank, then check out the Revere Sport Running armband. It’s like wearing an extra sleeve on your arm but compresses comfortably and securely. No bouncing with this armband. Unfortunately, it doesn’t have a touch screen; however, it’s an ideal option for quickly tucking your phone away or holding small accessories. It fits phones up to 6”, built with an easy-to-access earphone port, and is both breathable and lightweight. With this sleeve style armband, you will avoid rubbing and pinching. It does offer specific sizing options, so measure your arm first. Here’s the best way to describe this armband: a simple, low-cost alternative for your next run. Low-cost option so won’t break the bank. Superior comfort from compression material. Ultra lightweight for a smoother run. Pocket for keys and cards. Easy to slide onto your arm without any adjustments. Various sizes so must match with your arm size. The VUP running armband in one of the more innovative bands on the list. Instead of your phone sliding into a pocket or sleeve, it attaches to corner straps with a clip that rotates 180 degrees. This unique set up becomes useful when you want to make an adjustment on your phone mid-run. Although it’s an innovative design, you have to be careful the phone doesn’t bounce too much, or you risk it falling out. I’d recommend this armband for more of a smooth road run than say a technical race on the trails. It’s made from a comfortable stretchy silicone and utilizes an adjustable Velcro strap for quick adjustments. If you’re looking for a “not your everyday” running armband, then give this one a shot. Easy to use the adjustable strap. 180-degree screen rotation for a better view while running. Comfortable material, great for sweating. One size fits up to 14” arm circumference. Phone not as secure as a running armband with a slot or pocket. As you can see, there are plenty of reasons to use a running armband. You now know how to pick one out for yourself. So take your time, find the best running armband for you, and most importantly above all: Get out the door and run!